Most NFL clubs won't be sending out a big envelope of credentials for the entire season anymore. Be prepared to go to will call every Sunday this season in many NFL cities. My favorite time of the year is just around the corner: Are you ready for some football? But a lot has happened since the start of the 2001 NFL season and things are very different now in what I like to say "in the current environment". This football season will be the first full one since the events of 9/11. We have seen how this has affected how we work with tighter credential policies established during the post 9/11 football games and with the NBA and MLB. But what is in store for photographers with NFL credentialling in this new season and "in the current environment"? Using that handy new resource on the SportsShooter.com web site, The Guide, I e-mailed all 32 NFL teams asking what changes were ahead for the 2002 season. Greg Aiello, NFL VP for media, confirmed that the league does not have a universal policy on media credentials and it is left up to the team to decide how they want to handle it. "Distribution of media credentials is a club matter except for Championship Games and the Super Bowl when our office takes over the responsibility, "Aiello said, "After 9/11 last year, many clubs revised certain credentialling procedures as part of an overall increase in security." Several like the Cincinnati Bengals, New Orleans Saints, Jacksonville Jaguars, Chicago Bears, Tennessee Titans and Miami Dolphins report no significant changes. 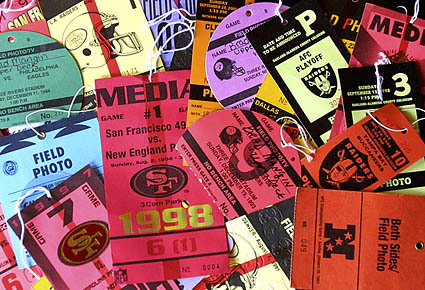 But it looks like most teams have gone the way of the San Francisco 49ers and have eliminated issuing season game-by-game credentials. "Basically, we are not sending out any paper game credentials prior to the game. We will still be issuing permanent (with their picture) credentials to those that cover us every game," said Cindy Krawczyk, the 49ers' publicity manager. "Everyone else is required to pick up their credentials at Media Will Call B on the day of the game, and show two forms of ID to do so." So the "beat guys" --- reporters that are assigned by a publication to cover that team --- will have the benefit of season credentials. Photographers for the most part, will have to pick up their passes at the stadium before the game. 'We have issued photo IDs to all media who cover the Bills on a regular basis (in other words, all 8 home games), " said Buffalo Bill's Scott Berchtold said, "If a photographer does not fit into that category, he must pick up his/her credential on game day at the Will Call window. For newspapers that have a large staff or rotate football assignments, this could be problematic. Many NBA teams instituted a similar policy, with season credentials having a specific name and mug shot printed on them. But for large papers like the Los Angeles Times, the cost of post 9/11 changes meant that for every Laker and Clipper game they staffed, they had to FAX a name to the teams 24 hours before the game and that the photographer had to wait in line at will call to pick up the pass. "It sucked," said one unhappy photographer, "They open will call two hours before game time and we need to be on the floor earlier than that to do remotes. There's a lot to do before a game and you have to really rush to mark a spot, do remotes and then set up your computers." The New York Giants apparently have taken the photo ID a step further and would like to issue them for even game day credentials. "The Giants are issuing photo ID season credentials that will be made available in advance... ideally," the Giants' Pat Hanlon told Sports Shooter, "We will also issue photo ID individual game credentials...we have not yet finalized how we will distribute, in advance or at will call." A few NFL teams told me that they have made only minor changes. The Kansas City Chiefs for instance has changed the application process. Now you must apply for credentials via the team web site, www.chiefsmedia.com. "This site (which launched Friday) will be a media-based site with everything from Tuesday packet information, depth charts, current rosters, breaking news, etc." said Morgan Shaw the team's manager of media services. "The credentials themselves are the same. We have not yet gone to a photo ID, but I assume in the coming years we will, " Shaw said. Increased security was sited by most as the reason for changes that were made after 9/11. "Like everybody else, we are tightening up our procedure to ensure the safety of everybody attending and/or working our games, " Hanlon said. Also expect the lines at media entrances to continue to be jammed as well as the will call windows around the league as teams continue policing what can be carried into venues and searching all bags and equipment cases. "You should expect security measures at media entrances to be essentially the same as last year post 9/11, although clubs have the right to make changes they deem necessary, " the NFL's Aiello said. He added that eventually the NFL hopes that all of its teams go to pictured ID for the media. "We do not issue guidelines on how media credentials should be distributed. Again, it's a club matter as is the use of photo credentials," Aiello said, "We think the use of photo credentials is a good idea and we are now using media photo credentials for our league-controlled events." The other fallout from the changes in how teams issue credentials is they hope to weed out the people who don't really belong on the sidelines of games. 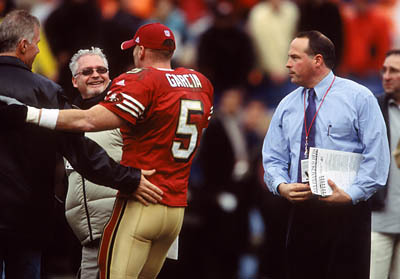 49ers cool PR guy Kirk Reynolds in action after a 2001 game at Candlestick waiting for Jeff Garcia. "Hopefully it will tighten up security and cut out some of the imposters who show up to the games," the 49ers Kirk Reynolds said. Most teams noted that they would send out press parking in advance for those that have to pick up credentials at will call. Also, be prepared to show plenty of ID to get that day pass. "We have also implemented a stricter policy for our credentials." Jennifer Rojas of the Chargers said, "We are issuing photo badges to the media in our press box and press booth, not TV or photo, that cover our games 90 percent of the time. We will not be mailing out credentials; all credentials must be picked up in person. All media must provide drivers license, date of birth and address to receive a credential." For those of you that cover the NFL, more lines and longer waits are ahead. I suppose it's to be expected in "the current environment." Sitting in my hotel room late at night on assignment in beautiful Missoula, MT, I couldn't help but think how fortunate it is we have so many great people in this business that are willing to share their experiences with me and all of you. This month, Sports Shooter brings you a humorous and informative article by Darren Carroll on covering the Open Championship (AKA The British Open to the less informed). We also feature an in depth piece by Trevor Collens on covering the around the world balloon flight by Steve Fossett and Bob Larson tells us about his favorite avocation: pizza & beer. Peter Read Miller writes a user's report on the new Canon D-60, Ron Vesely tells us about how he had a hand in a big baseball trade, Rick Rickman and Mongo Johnson check in with their regular columns. I have one sad item to note the passing of our Sports Shooter Q & A columnist, "Dear Snappy". But there is good news: the regular column has been taken over by "The Photo Dude". So sit back, adjust the contrast on that monitor, turn the volume down on that Elvis CD and enjoy Sports Shooter v.45.